GENT, Belgium (VN) — Wout van Aert has made quick progression since starting to mix his cyclocross career with the big classics last season. Now, in 2019 ahead of the Tour of Flanders, he has stepped ahead another level thanks to the yellow guard of Jumbo-Visma around him. He still has yet to win a big one to add to his three cyclocross world titles, but at 24 years old, there is time. However, he now appears to have the backing to do so with Jumbo-Visma. Van Aert only placed 29th in Wevelgem, but his team shook apart the race in a show of force just one week before the Tour of Flanders. A yellow wave swept over the peloton in the opening hours. The same team that supported Steven Kruijswijk and Primoz Roglic in the 2018 Tour de France, or last month helped Roglic to win Tirreno-Adriatico, now rallied around van Aert. He looked around when the race broke into echelons to see teammates Mike Teunissen, Maarten Wynants, Taco Van Der Hoorn, and Danny Van Poppel. It had a numerical advantage with five riders in the first 20-man group. Teunissen shot free later on the climbs with Peter Sagan (Bora-Hansgrohe) and Matteo Trentin (Mitchelton-Scott). The big sprint teams pushed to catch them at 17km out. Jumbo-Visma set up Van Poppel to sprint to fifth behind winner Alexander Kristoff (UAE Team Emirates). Van Aert showed his development from one-hour ‘cross races to long road races by placing sixth after nearly 300km in Milano-Sanremo one week ago. The team, after 200km, showed its muscle in Wevelgem. With the climbs and twisty, narrow roads, it was a proper test heading toward the Tour of Flanders. “The most beautiful one,” said Van Aert. Van Aert said that his team can take on and challenge Deceuninck-Quick Step’s supremacy. The Belgian super team won nearly every one-day WorldTour race this season from the Cadel Evans Race to the E3 BinckBank Classic. “I believed in this before, definitely. My team is strong and is able to win races, as well. We have a captain, Maarten [Wynants], who is experienced and important in our team. 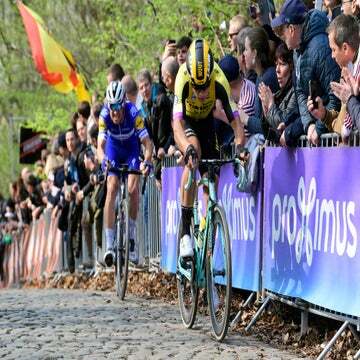 He made the decisions [on the road Sunday],” Van Aert said. 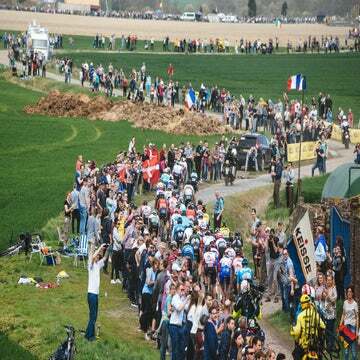 Belgian fans and those around the world are hungry for the next superstar cobble crusher to emerge after Tom Boonen and Fabian Cancellara ruled. Peter Sagan and Greg Van Avermaet are staking their claims. And van Aert now is questioning what it could take to start winning. “It’s a hard question. It was difficult with a big group coming to the finish line [in Gent-Wevelgem] and it’s hard to do the right tactic because there are teams for sprinters to close to the gap,” Van Aert said.